Long-distance calls have a variety of functions in different animal species. However, where multiple functions are proposed for a single long-distance call type, little is known about their relative importance. Chimpanzees are one species where several functions have been proposed for their long-distance call, the pant hoot. 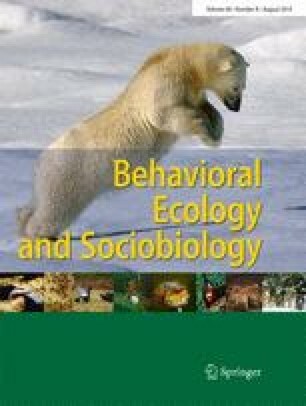 In this study, we investigated the effect of social factors, including the rank of the caller, party size, fission–fusion rates, and the presence of estrus females as well as ecological factors including the type of food consumed and travel time, on male chimpanzee (Pan troglodytes schweinfurthii) pant hooting, in order to identify the key correlates of this behavior. The wild male chimpanzees of the Kanyawara community, Uganda, produced more pant hoots on days when there were frequent changes in the male, but not female, composition of the focal’s party. This factor accounted for the largest amount of variation in pant hoot production, and we found that males were more likely to repeat a call prior to rather than after fusion with other males, suggesting that the calls facilitate fusion. Pant hoots therefore seem to play a pivotal role in regulating grouping dynamics in chimpanzees. Our study also shows that pant hooting was positively correlated with the rank of the caller, the presence of parous females in estrus, and the consumption of high-quality food, suggesting that pant hoots signal social status or social bonds when between-male competition is high. This study supports the view that pant hoots fulfill a complex social function. The authors would like to thank the directors of the Kibale Chimpanzee Project, Richard Wrangham and Martin Muller, for allowing them to conduct this research on the Kanyawara chimpanzees as well as for commenting on a previous version of the paper. The KCP field manager Emily Otali and KCP field assistants Francis Mugurusi, Solomon Musana, James Kyomuhendo, Wilberforce Tweheyo, Sunday John, and Christopher Irumba, who were extremely helpful during the fieldwork are also thanked. The authors also thank Stuart Semple and Geoffrey Hall for helpful comments on a previous version of the draft and Simon Townsend for statistical advice. Comments and suggestions were provided by the editor David Watts, and two anonymous reviewers substantially improved the paper. PF was funded by a BBSRC studentship, a Leakey Foundation General Grant, and an American Society of Primatologists General Small Grant. Permission to conduct the study was granted by the Ugandan Wildlife Authority and the Ugandan National Council for Science and Technology. The study complied with the current laws of Uganda.